Choi, K-S., Cha, Y-M., Kang, S-D. and Kim, H-D. 2015. Interdecadal variation of TC frequency in Japan. Theoretical and Applied Climatology 121: 179-186. Explaining the rationale for their work, Choi et al. (2015) write that "few studies have been done on [the] variation of tropical cyclone frequency that [affects] Japan." Therefore, to help close the data gap for this part of the world, the team of four Korean researchers proceeded to investigate trends in tropical cyclone (TC) data impacting Japan, defined as TCs passing through the region 30-40°N and 130-145°E, over the 35-year period 1978-2012. So what did they learn? Confining their analysis to the summer months of July-September, Choi et al. report that approximately 5.5 TCs affect Japan in any given year. 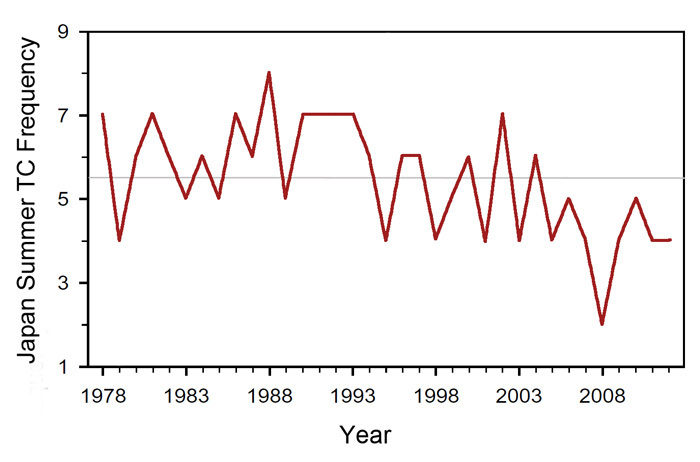 However, as shown in the figure below, summer tropical cyclone counts have been declining for most of the 35-year period. In subjecting these data to a statistical change-point analysis, the authors were able to further determine that a regime shift occurred around 1995, where the average number of summer TCs amounted to 6.2 per year prior to that period, falling to 4.6 per year thereafter. No matter which method one prefers to use in analyzing the data (linear regression or change-point analysis), one thing is clear: the frequency of summer tropical cyclones is not on the increase in Japan. And that observation is contrary to the expectations of most climate alarmists, who presume they should be increasing in response to global warming. Figure 1. Frequency of tropical cyclones affecting Japan during the summer months of July-September over the 35-year period 1978-2012. The long-term average of 5.5 tropical cyclones per year is shown in light gray. Adapted from Choi et al. (2015).